The album starts off with a dark acoustic song with sporadic phasing of bent circuits titled, “Halloween Out Walking.” That is followed with “Ten Dollars On The Ground.” The track has a basic Elf Power structure – simple music with complex layers and lyrics, fuzzy, sad, and happy. The steady beat is a reoccurring staple in their music. Another song of classic structure is “Sniper In The Balcony.” The poetic lyricisms and fleeting emotional values embedded within the low fidelity production takes the listener back to When The Red King Comes. Also in that similar vein of nostalgic sound is “All Things Combined.” It is a genuine 90’s indie track as per the instrumentation and melody, but with a fresh production quality. 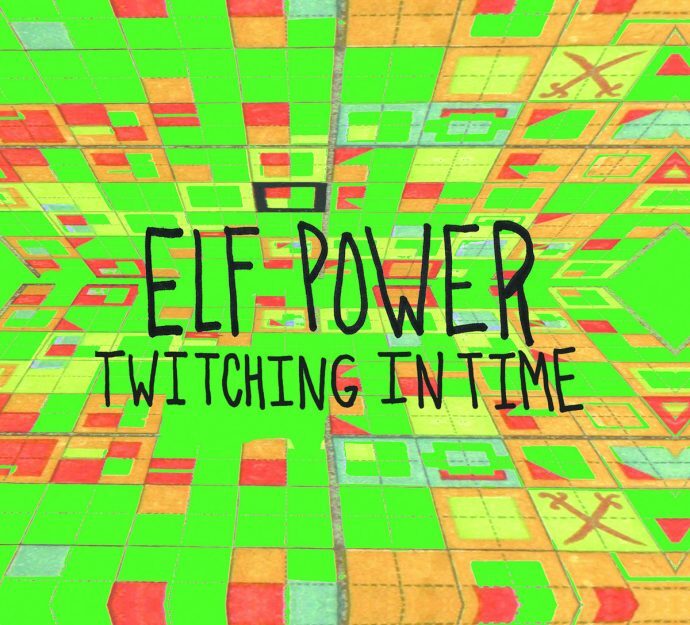 Aside from the familiar sounds, every Elf Power release has accomplished new levels of experimentation. This time, their experimental side has taken on a higher tier of maturity, as is with “Watery Shreds.” It is a clean piano with a classical ballad feel that is ruptured with a layer of a distorted guitar. The noisy guitar slides around accenting the keys and vocals, taking Elf Power’s ambient boundaries to new extremes. The album has a few other mature songs in the mix (“Too Many Things In My Hands,” and “Cold Vines”), creating a trifecta of old, new, and a blend of the two. Twitching Through Time has the roots and stalk of traditional Elf Power composition, and branches of experimentation as is their nature. Moogs, zanzithophones, fuzzy strings, 90’s lo-fi melodies, psychedelia – this is a versatile album that will satisfy old fans, and welcome the new. The song placement gives the feel of “twitching in time” with Elf Power from the early nineties to the present. A feat for the band and a collective accomplishment of hunting and gathering their own sound for two decades plus.